The current World Health Organization guidelines are for children and teenagers to do 60 minutes or more of physical activity daily, and for adults to do 150–300 minutes of physical activity per week. 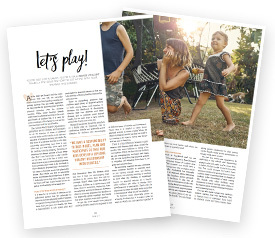 As the mum of a six-year-old, life is a lot less physically demanding now than it was when my son was little, when we’d both be moving, running, playing, throwing or catching for decent periods of time every day. Now I can leave him to play outside on his own, and if he has a friend over, I don’t have to join in their physical games. Once parents don’t need to be involved in their children’s physical play, it is common for many to become much less physically active. And while my son is extremely active and enjoys almost any form of sport, I deﬁnitely notice that when life gets busy for Mum and Dad, it gets harder for him to get as much activity as he needs too.